This year two of my closest friends tragically lost their 9 month old daughter. My goddaughter. This is extremely difficult to talk about and it is often seen as a taboo subject. I know people read my blog page and I wanted to share something with you all, which I am hoping people will be able to help with. Millie was at nursery and choked on some food. There is an investigation on going to determine what happened. My friends have been incredibly strong over the past few months, and have put together and started Millie's trust. A charity which will provide money for people to attend first aid courses with a focus on first aid for babies and toddlers. 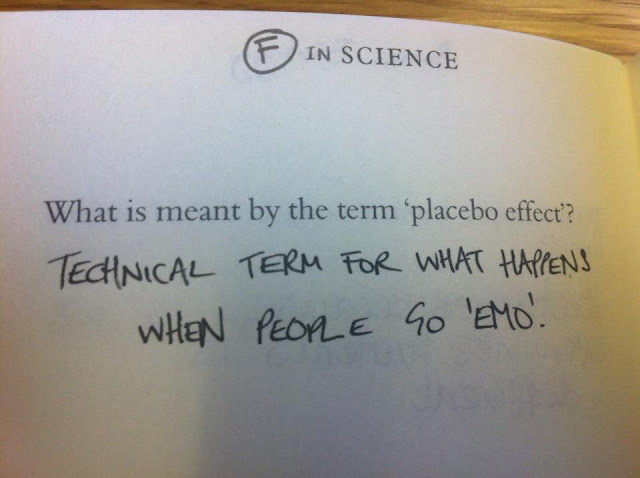 What is meant by the term 'placebo effect'? This is from F in Science.. a collection of lol answers from science. I bought it this morning and it made me smile and I thought I would share it. What would an independent Scotland mean for UK Science and Technology? I'm not going to pretend to know a lot about Scottish politics because I don't. But I am interested in what impact independence would have on science and technology - not just in Scotland but across the UK as whole. Science and technology funding comes from Westminster and the research councils that allocate this funding are UK wide. An independent Scotland could mean a complete reorganisation of the councils and funding allocations, which would affect science and technology across the whole of the UK. Last month I attended Science and The Parliament in Edinburgh. An event organised by the RSC that brings politicians, policy makers, scientists and research councils together. Jolly good event. The event finished with a panel debate that tackled the question 'What would happen to science and technology in Scotland if it became independent'. Science images are becoming commonplace on social networks. But how are these beautiful, artistic images made and what use are they in research? I've taken quite a few images throughout my PhD. So many my university computer struggles under the weight of them. 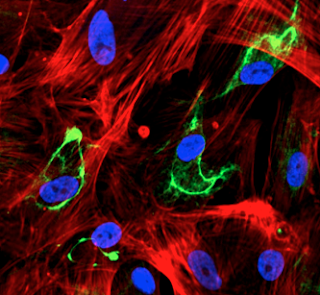 I've been taking microscopic images of cells to understand how the cell cytoskeleton allows them to move. And it has been one of the most interesting and favourite parts of my PhD project. There are a number of ways of creating these images. The images all represent one or two components of the cell. Cells need to be fixed (in a fixative, like methanol or paraformaldehyde, to preserve them and the proteins and structures inside the cell). Different fixatives can be used depending on what it is you are looking for and how you are looking for it. Fixatives stop all movement, any reactions happening in the cell(s) and preserve and protect from degradation. Is the sherry that makes you merry going to make you heavy? 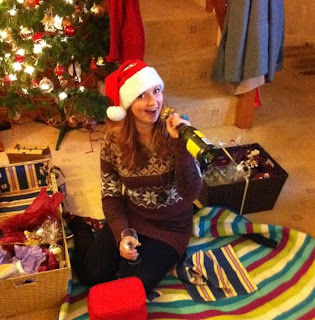 Alcohol and weight gain are two things associated with the season of merriment also known as Christmas. Most people pile on a few pounds over the festive period but is it really down to the sherry? A recent story highlighted the hidden calories in booze and warns of high calorie intake from alcohol in the US population. It makes a good point, people forget that drink contain calories and therefore may unintentionallybe consuming more than they realise, leading to an increase in dress size. The NHS choices website from the UK also have a section about booze, weight and hidden calories. I am presenting a session at the #PhDjourney conference about social media and the PhD on Wednesday. I will post my slides and information after the talk, but as I was preparing I thought I would put together a list of useful online tools for keeping up with what is going on (and remembering what has happened) at conferences. Please add any suggestions and thoughts. Facebook - conferences usually have a facebook page, which can be useful before the conference to connect with people and learn more about what will be happening at the conference (and useful for keeping up to date, when full programmes are announced). Find the page by searching facebook for the conference, or looking for a facebook link on the conference website. Facebook is of limited use during the conference as you will only be able to see official updates from the organisers and/or posts from people you know at the conference. A facebook can be a good way of sharing blogs and other posts after the conference. 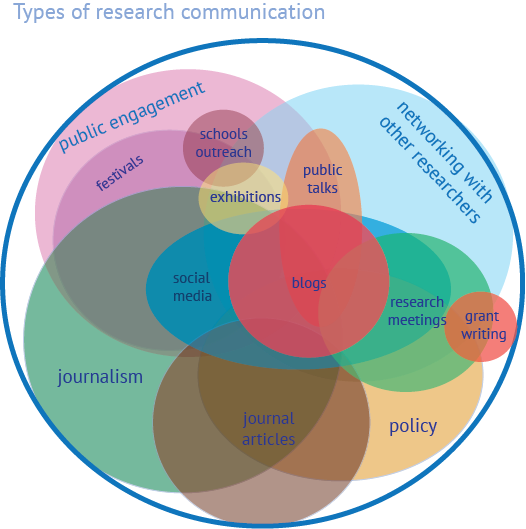 I wanted to create something to visually represent different types of research communication. I wanted to get the point across that not all communication is public engagement, similarly not all blogs or social media is public engagement, or journalism. But some are. I think there is a place for all of these in research communication different people contribute to different parts in different ways and amounts. Please note, this diagram is not based on data and it isn't supposed to represent relative contributions to science communication (although if anyone had any ideas/data so I/we could do that it would be amazing). It represents overlaps. I wanted to use this with researchers to show how varied research communication is. Any feedback or suggestions would be great! Does the PhD process need changing? Just so you are aware, there is a conversation happening on the Nature Soapbox Blogs website and on twitter hashtag #phdelta about the PhD process and if it needs changing. There are lots of reflections, thoughts and comments coming into the debate. I have written a post about science communication and the PhD and this has sparked the question, should science communication activities be compulsory in a PhD? You can read it here. Join twitter. If you need help getting started with twitter, this might be useful ! I've started a Pinterest board for 'fashion inspired by science' you can see it here. Next up, I came across Jayne @cosmeticproof who is a scientist herself. I think my favourite are these DNA nails! I'm not sure my hands are quite steady enough for anything that intricate, but I might attempt some cell cytoskeleton/ actin inspired nails! What makes a PhD Thesis? 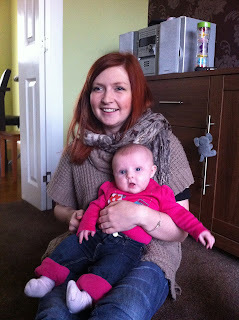 *warning* this is a self-indulgent blog post. 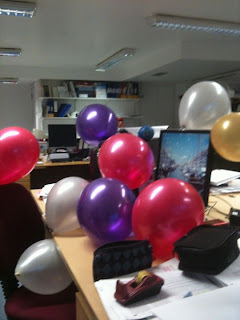 I am suffering from a large bout of PhD thesis 'tunnel vision'. All I can think about at the moment is the massive amount of work I have to do in such a short space of time. When you have three years of work, a computer full of data and a head full of thoughts and ideas... where do you start? The worry of unemployment also likes to creep in... I don't have a job lined up for when I finish (yet, but there are some things in the pipeline). My aim is to be mostly finished by October. My last payment from my PhD will be in August. My brain starts panicking about all of these things at random times throughout the day, and then I can't get anything done. It took me ages to get writing. I had a plan, but I still found it completely overwhelming. I'm usually someone that forms a plan quickly and then gets going and I wasn't. So I started getting stressed about that. I often wonder if scientists (working on any project) in a university should be audited regularly. Audited by an independent person who is independent of the specific project, subject and research group. The scientists in question would have to show that they can trace the ingredients they are using for experiments and prove that results are real (maybe the auditor would sit in on an experiment). Would it help prevent mistakes, incorrect data, reduce paper retractions and increase credibility of science in general? Or would it just be a big waste of time, money and be a painful process for everyone involved? When I worked in industry, we were regularly audited in everything we did. I used to exist in a form of organised chaos, but knowing that anyone could ask to look at anything at any time (and they did), I became super organised. Why do women's magazines not promote critical thinking when it comes to beauty and health? ﻿﻿Women's fashion and lifestyle magazines have a bad habit of spouting pseudoscientific guff to their readers in in order to raise revenue through product placement, and advertising. I like clothes, handbags and shoes but that doesn't make me stupid air-head or any less of a scientist. I want to know what the latest and best in beauty is, but I do not want to read rubbish science and products that claim to provide more than they will ever be able to offer. Move over books, it’s the Age of the Internet, and blogs are the literature of choice. These aren’t the blogs of the Myspace era that shared too much information about teen troubles, break-ups and parent problems. The new wave of blogs are well written, informative, can help keep you up-to-date with the latest and greatest, or quite simply exist to provide entertainment. And as we are Au Science Magazine, I have taken a look at some of the science blogs out there in the crazy land of the Internet. Science blogs are often hosted by expert science writers and/or scientists. They debunk the latest news stories, explain the latest research as it is published and, best of all; they are easily readable on a quick lunch break.